The Essence of Religions was written to discourage the misuse of religions. This book provides the tools we need to reconsider many of the dogmas of the five major world religions that have proven detrimental to both human coexistence and our planet's survival. Furthermore, it seeks to replace these misguided belief sets with a more unifying and uplifting outlook that will benefit mankind as a whole. The author urges our alignment with "The Light" of unconditional love that can be found in the teachings of Christianity, Judaism, Islam, Hinduism, and Buddhism—and The Light of compassionate love in visions recounted to us by those who have undergone near-death experiences (NDEs). The author of The Essence of Religions, Christophor Coppes, examines the NDE phenomenon as if it were a religious experience, placing it in context by comparing it to the five major world religions. 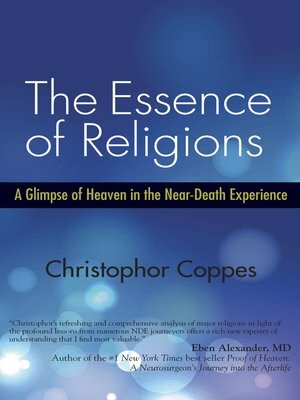 Coppes gives a compelling argument that many characteristics of these religions' view of the afterlife are analogous to the life-changing sensations and visions reported by those who have undergone an NDE. But he concludes that although the essence of these beliefs of the major religions can be found in NDEs, not all of the positive elements of an NDE experience can necessarily be found in the religions.